Mood board: It was back to business as usual at Giorgio Armani, where the venerable designer leaned back on his beautiful menswear laurels. Suiting was key this season, and the silhouette got upgraded with a soft swish around the legs, a loosened crotch and cropped leg, without ever veering into 80’s flood territory. Best in show: Our favourite segment in this show was the moment mid-way when Armani plunged into a pool of velvet and corduroy. He’s done velvet plenty in the past but the the corduroy felt distinctly preppy and refreshingly new for this purist designer, especially when cut in bright shades of cherry red and pine green, on loose pant and snug, cropped jackets. Finishing touches: Armani loves a tricky accessory and this season he seemed fixated on sweater scarf hybrids creeping along arms and wrapping up around the neck. 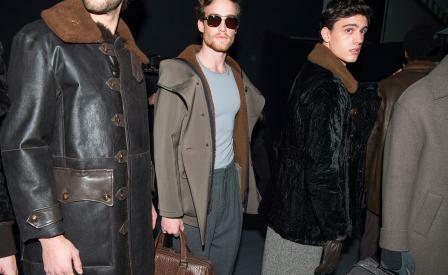 More reasonable were the sturdy and sporty alpine boots paired with winter suits and dopp kit shaped bags.